URBANIZATION - URBAN SCALE SITE DEVELOPMENT - Website of tomphillips! 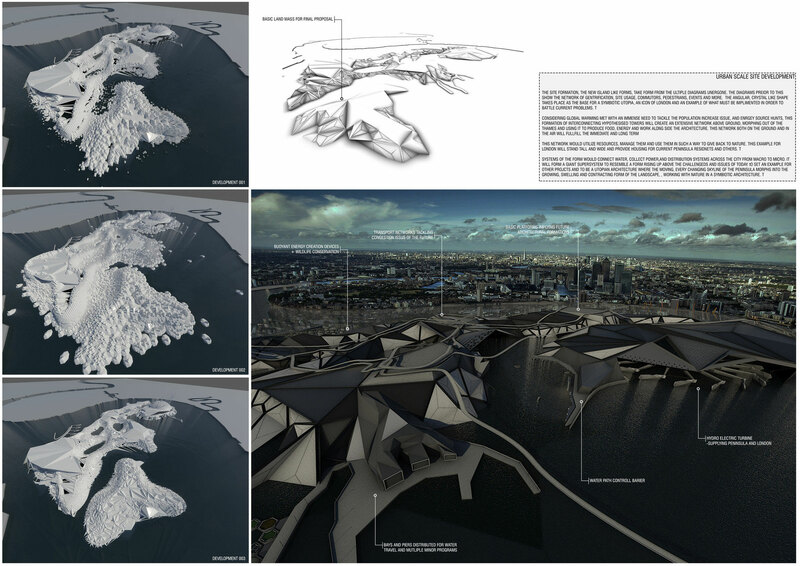 THE SITE FORMATION, THE NEW ISLAND LIKE FORMS, TAKE FORM FROM THE MULTIPLE DIAGRAMS UNDERGONE. THE DIAGRAMS PRIOR TO THIS SHOW THE NETWORK OF GENTRIFICATION, SITE USAGE, COMMUTERS, PEDESTRIANS, EVENTS AND MORE. THE ANGULAR, CRYSTAL LIKE SHAPE TAKES PLACE AS THE BASE FOR A SYMBIOTIC UTOPIA, AN ICON OF LONDON AND AN EXAMPLE OF WHAT MUST BE IMPLEMENTED IN ORDER TO BATTLE CURRENT PROBLEMS. CONSIDERING GLOBAL WARMING MET WITH AN IMMENSE NEED TO TACKLE THE POPULATION INCREASE ISSUE, AND ENERGY SOURCE HUNTS, THIS FORMATION OF INTERCONNECTING HYPOTHESIZED TOWERS WILL CREATE AN EXTENSIVE NETWORK ABOVE GROUND, MORPHING OUT OF THE THAMES AND USING IT TO PRODUCE FOOD, ENERGY AND WORK ALONG SIDE THE ARCHITECTURE. THIS NETWORK BOTH ON THE GROUND AND IN THE AIR WILL FULFILL THE IMMEDIATE AND LONG TERM ISSUES. THIS NETWORK WOULD UTILIZE RESOURCES, MANAGE THEM AND USE THEM IN SUCH A WAY TO GIVE BACK TO NATURE. THIS EXAMPLE FOR LONDON WILL STAND TALL AND WIDE AND PROVIDE HOUSING FOR CURRENT PENINSULA RESIDENTS AND OTHERS. SYSTEMS OF THE FORM WOULD CONNECT WATER, COLLECT POWER,AND DISTRIBUTION SYSTEMS ACROSS THE CITY FROM MACRO TO MICRO. IT WILL FORM A GIANT SUPER SYSTEM TO RESEMBLE A FORM RISING UP ABOVE THE CHALLENGES AND ISSUES OF TODAY. TO SET AN EXAMPLE FOR OTHER PROJECTS AND TO BE A UTOPIAN ARCHITECTURE WHERE THE MOVING, EVERY CHANGING SKYLINE OF THE PENINSULA MORPHS INTO THE GROWING, SWELLING AND CONTRACTING FORM OF THE LANDSCAPE, , WORKING WITH NATURE IN A SYMBIOTIC ARCHITECTURE.